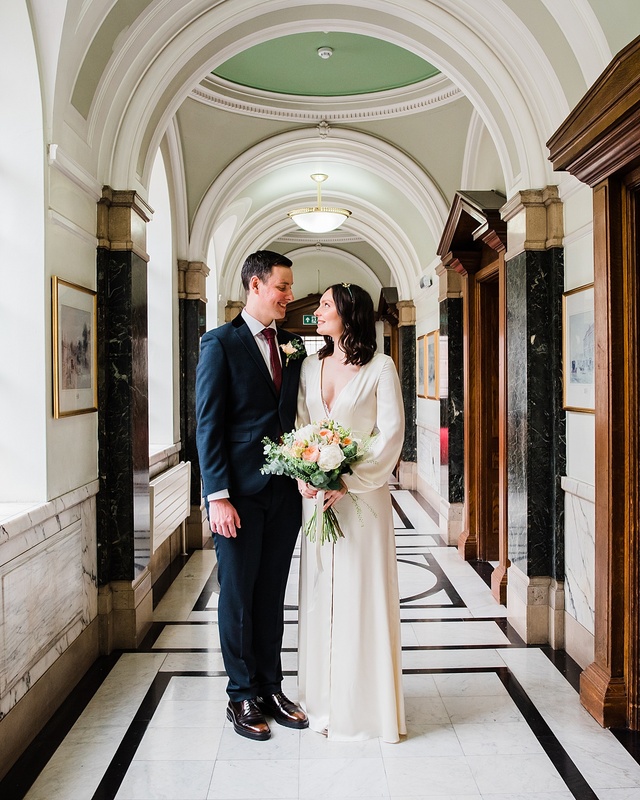 Georgina and Dan planned a beautiful and intimate London elopement at Islington Town Hall. 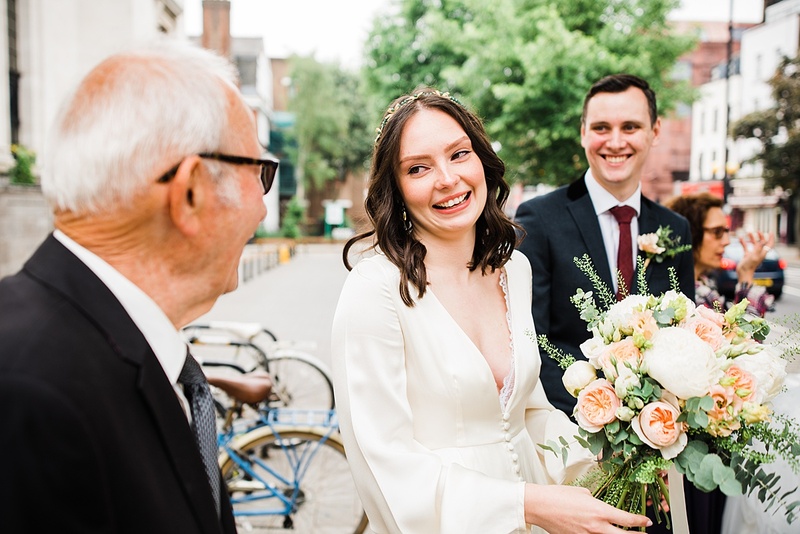 They invited just the closest members of their family to watch them sign the wedding register and followed the ceremony with drinks and food at a local pub. 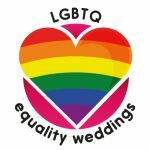 I couldn’t imagine a more romantic way to get married! We met at school! On a Geography trip aged 14 and 15. We were friends before “going out” and have never looked back. We lived together while at uni and have since moved all around London and done as much travelling as possible. We settled on East London 4 years ago and LOVE IT. Dan proposed in September 2016 and we got married a day after our 12th anniversary. It was in our flat on a Friday night, very private, very casual, very us. Dan recreated a meal we had eaten whilst travelling around Italy 5 years ago and he got down on one knee after pudding. We kept it a secret for 24 hours before FaceTiming our family. 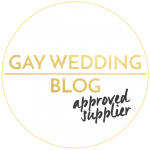 What was it like to plan your elopement? We loved it!! Every moment! I’m very organised so we booked everything quite early on, being decisive so we had plenty of time to enjoy the relaxed run-up. I can genuinely say it was completely stress-free and enjoyable. I miss it! 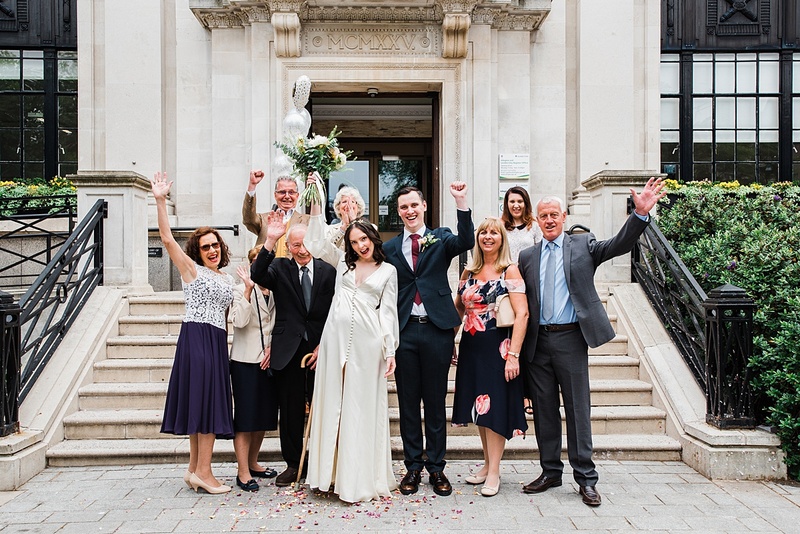 We had a small ceremony at Islington Town Hall surrounded by our immediate family, followed by a bigger ‘do’ in Italy the following weekend. 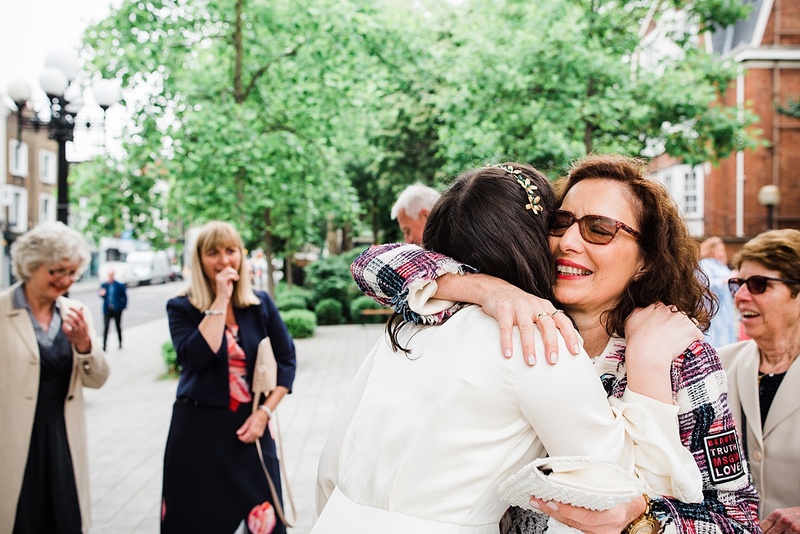 It was so lovely to have some time with our close family to celebrate our marriage before flying out for a party with 50 of our friends and family. 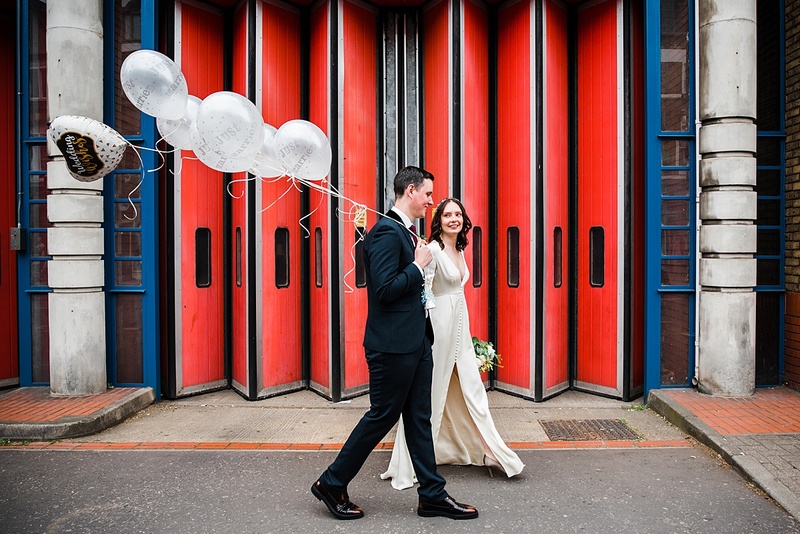 I wore a silk Temperley gown which felt so special to wear, with satin Manolo Blahnik heels. A dream outfit! 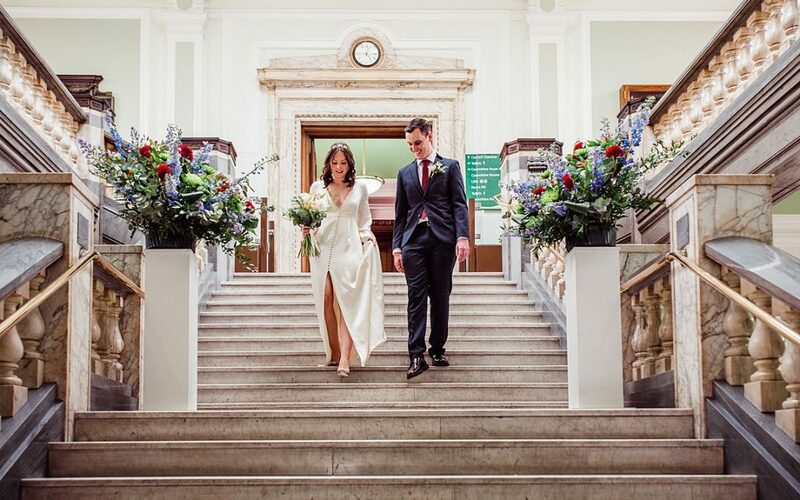 I bought the dress at a sample sale before we were engaged with plans to dye it but didn’t quite have the heart to do it! I’m so happy I got to wear it in all its glory. I’d wanted the shoes for years and the wedding was the perfect excuse to finally buy them. Dan wore a navy/black Next suit with brown polished Burberry shoes. The fabric has a great texture with velvet collar and the shoes were a nice alternative to the classic Oxford. 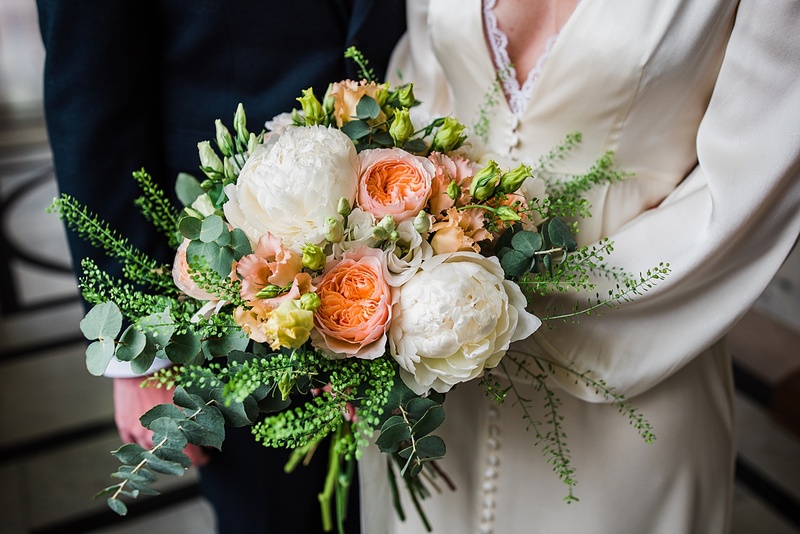 I carried a natural, wild bouquet with peonies, David Austen roses and lots of foliage. Dan’s button hole echoed this with a fluttery, blush flower and more foliage. 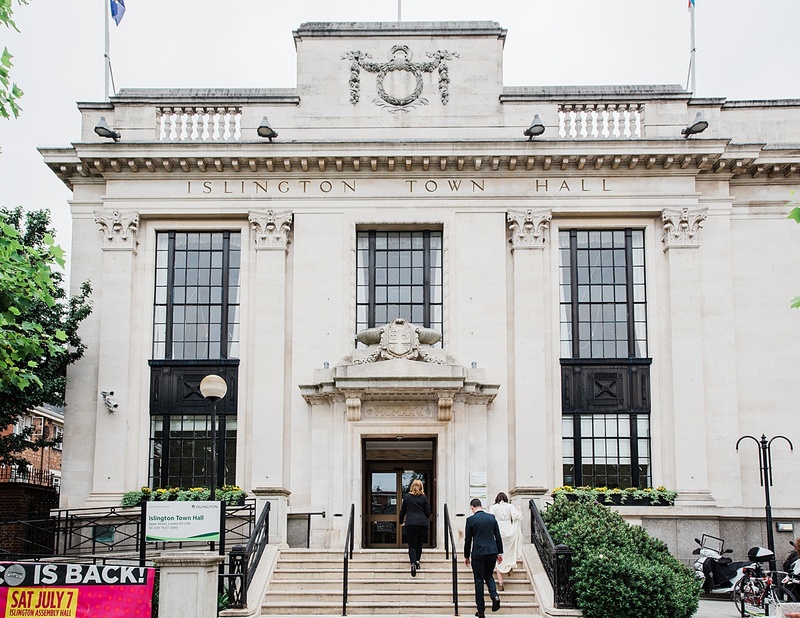 Why did you chose Islington Town Hall? The venue is already beautiful and because we were having a larger wedding in Italy the following week, we kept things simple. 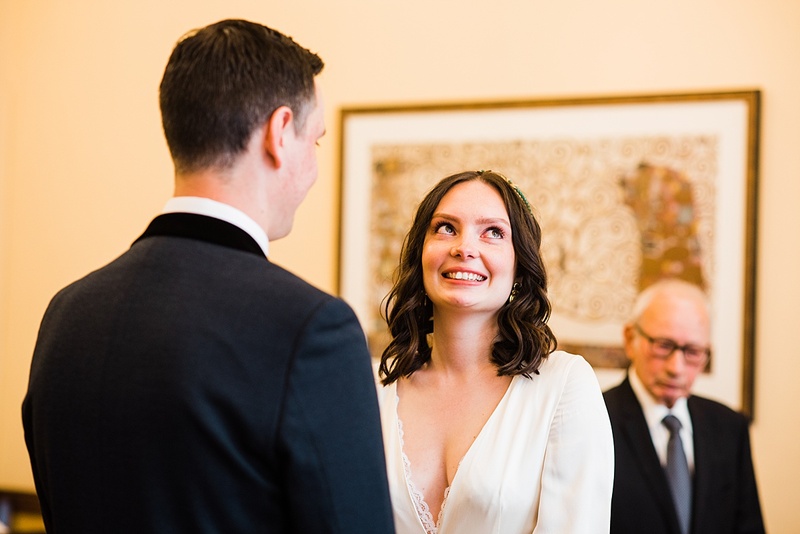 Although we stuck to the normal legal ceremony format and wording, it felt very intimate and emotional. 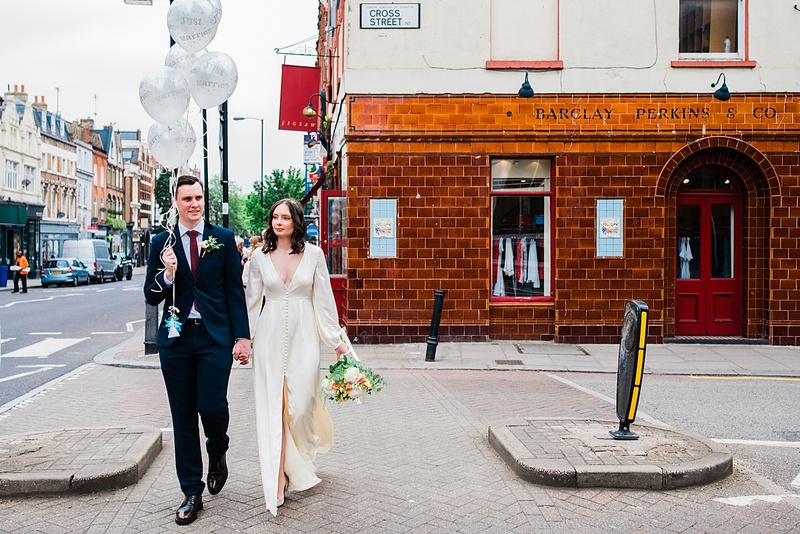 After the ceremony we walked in parade to The Pig and Butcher pub in Angel where we had the most delicious feast. A particular highlight was the bus driver honking and the little boy who asked if I was Meghan (Markle). It was 6 days after the royal wedding so fresh in people’s minds! Still made my day. 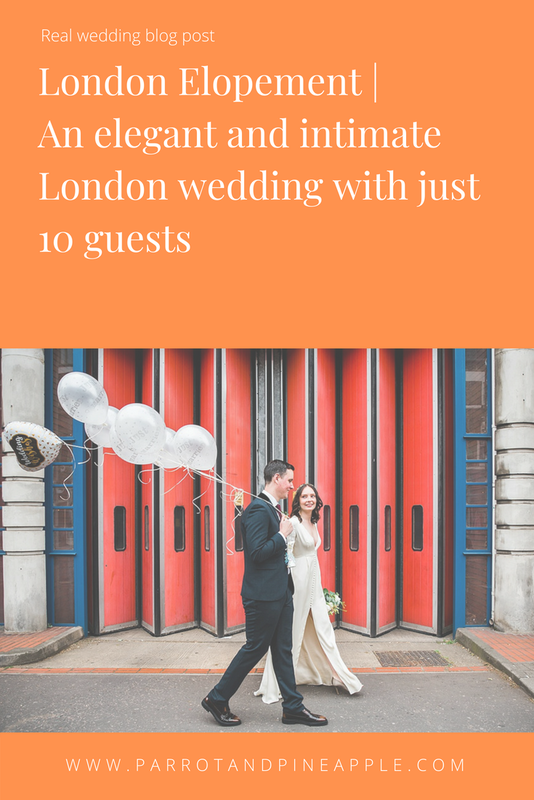 What advice do you have for other couples planning a London elopement? Be organised! Make decisions quickly and stick to them. 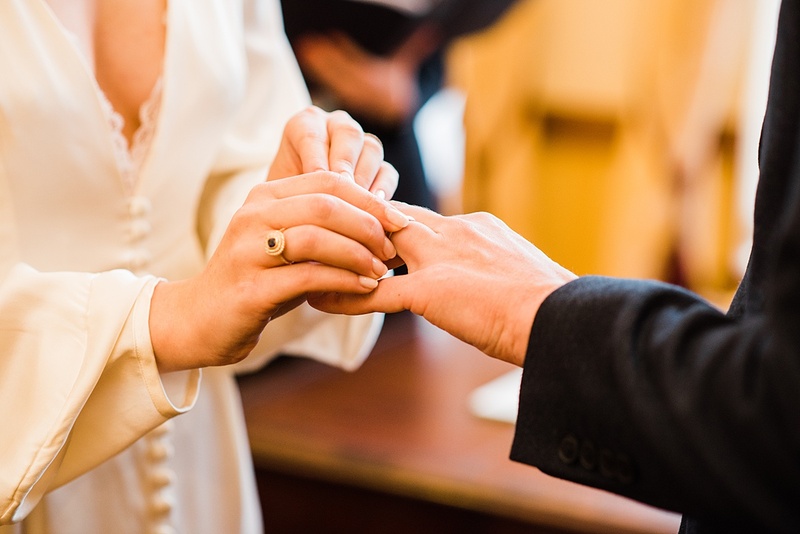 Don’t lose sight of why you’re having a wedding (to get married to your favourite person!). Savour every moment and breathe. You’ll remember everything so much more vividly if you are relaxed. We wouldn’t change a thing, the day was a complete reflection of us as a couple. We didn’t have a strict budget but we did decide quite early on what we were willing to pay for certain things. 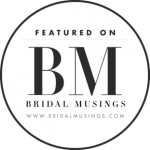 We focused on the key elements – food, the ceremony, drinks, music – and kept the rest simple. No one remembers the favours but everyone remembers a killer party. We had an extensive excel spreadsheet to keep track of it all! 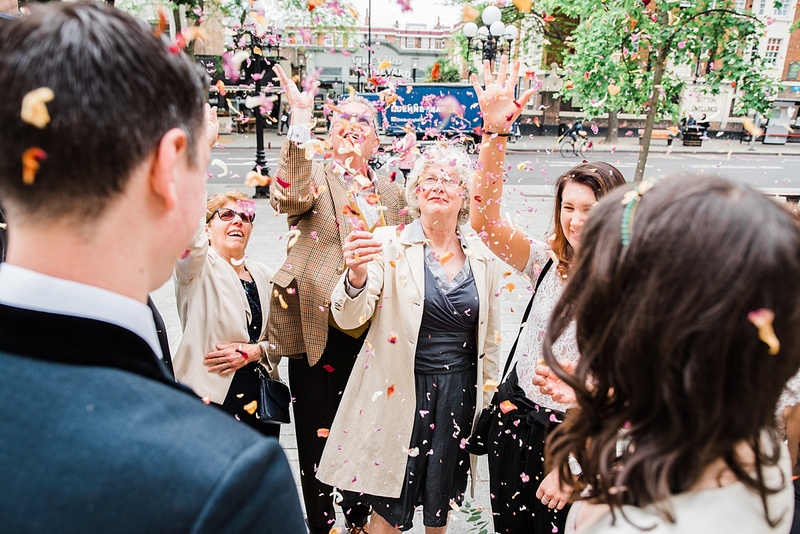 If you are planning your own London elopement why not book me to capture your special day so you can share the moment with your wider friends and family through pictures that document your story. 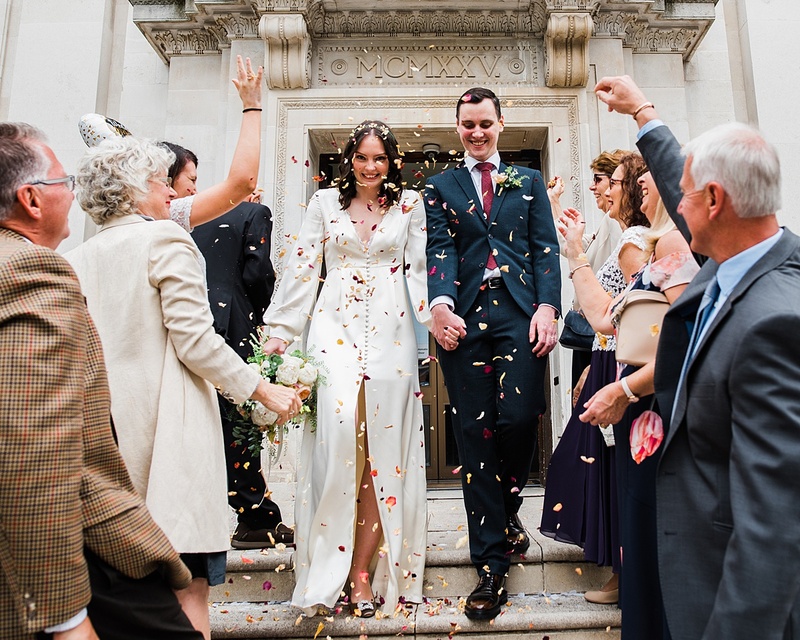 I offer an up to two hour photography service for £350, which is just enough to capture your ceremony, some relaxed and informal couple portraits, followed by some of your after ceremony drinks celebration. Contact me here to enquire about availability. Or see more city wedding photos on my blog here. 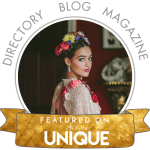 Remember this blog post by pinning this image!